Gold Coin (GLD): Terminal Phase of Correction is the time to BUY! On BitcoinLive; daily Crypto updates are made available while also, on demand analysis requests are fast filled. Join us as we have now opened up monthly and quarterly subscriptions. Use this link: https://bitcoin.live?aid=110. Below is an excerpt of a recent Bitcoin (BTC) cycle analysis. 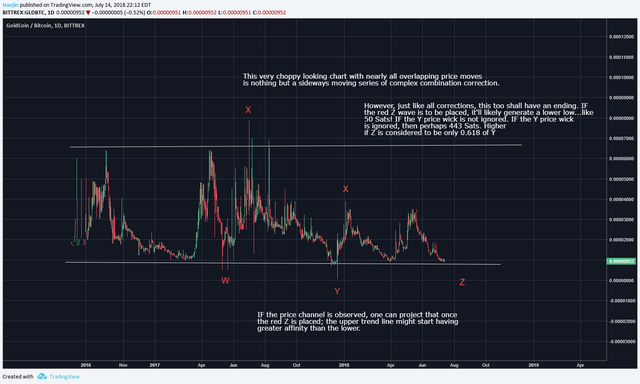 Goldcoin (GLD) is likely approaching it's terminal phase of the correction since a triple combination of wxyxz sequence ends in z which has at most an incremental lower low to hit before turning up. Your presentations are wonderful. I follow you, you work very well, hope that you will always be with us by giving us good, good work. Hi there! I just upvoted you, I am a semibot that sometimes vote on great content or sometimes just Create useful content. I am helping @cheetah , @FollowForUpvotes , @minnowSupport , @steemgigs , @dropahead #bots and other users right now for making the steem more helpful to new users. Contact me if you want me to follow on your content or comments. If you have any query then please contact me. You can always send me SP or SBD so i can keep helping you indirectly by helping these awesome bots. Random Gift Photo For Your Better Mood: Click It! The currency correction is the same as that of the teeth. It works by mechanical pressure and in cryptos everything is gas. Hmm, very interesting metaphor. Though, mechanics are purely sentiment based. There are attempts to manipulate, but they usually go in the direction of sentiment.